Adventure Mining Company – Let's Go RVing! We knew we had to get moving this morning so it only took us about 45 minutes to get coffee and breakfast! We rode our bikes on the bike paths and both of us got a little over 6 miles. Marquette is a very friendly bike/walker town with several biking paths however when you run into two women casually walking their leashed dogs and taking the entire path it gets interesting. Unlike Silver Lake the cars stopped for the bikes to cross! We quickly got in, got showered, dressed and ready to roll and it was still after 10:00. By that time I had dropped my iPad on the floor and the glass screen had shattered, think splintered glass.  Hopefully I can get it repaired before we get home, perhaps in Asheville. I feel kind of lost without it. That’s pitiful! Just as we were leaving I saw an e-mail from the library saying that my audio book was ready for download. Since I’m running low on my data on my phone I couldn’t download the book then. Unfortunately the 120 mile trip to Octonogan was the least scenic of any leg of the journey, no beautiful coast to gaze at even though we are on the Circular tour of Lake Superior. There were few towns and few accessible gas stations. We had a ½ tank but didn’t want to get too low not knowing where we’d find a station. Actually we found a truck stop in Octonogan and filled up just before we went to campground arriving little after 1:00. River Road Campground is small but so far everything is working. There are several big coaches here and I see a lot of fishing gear around. The Internet is not the fastest in the world but one of the fastest we’ve encountered since leaving home. To all campground owners: Please don’t advertise free Wi-Fi if no one can access it. I’d rather know that I am not going to have it than to think I am going to have but then can’t access it. I guess some would think it’s a sad commentary on our life that we are so connected to cell phones and Internet but with a 90 year old frail mother, six grands and one on the way we need to be able to connect! 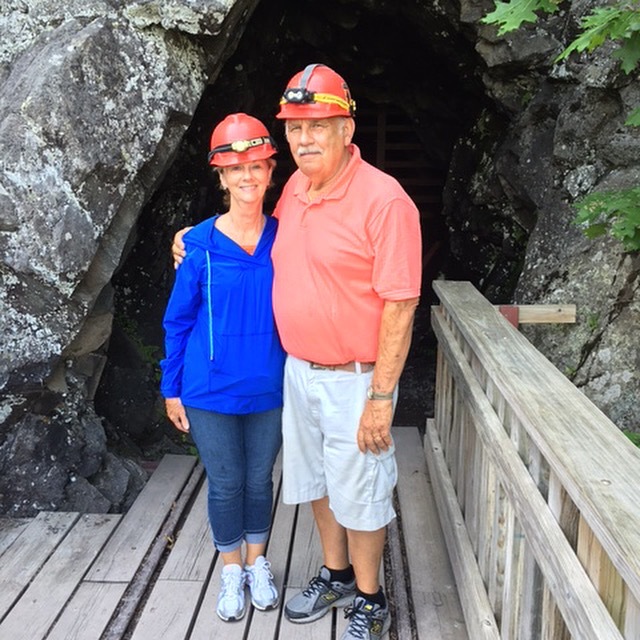 As soon as we got settled and got lunch we headed toward Adventure Mining Company for an underground tour of a copper mine. There are four different levels of tour including one that included rappelling down the shafts. We chose the first one, just a basic tour but it was very interesting. Of course we all had to wear hard hats (my hair was pretty when I took it off). We also had to walk through the disinfectant for white nose syndrome for the bats. The guide told us we would probably see some bats since it was so hot today (90 degrees) but we didn’t. The guide was very thorough and gave a good synopsis of the history of the Adventure Mine. After we left the mine we rode through the small town of Octonogan. I located the beauty salon where I will be getting a trim tomorrow. I desperately need it but am a little nervous. Oh well, I guess it’ll grow out. Sherrill came highly recommended. Jerry cooked chicken on the grill and I fixed potato salad and baked beans. We normally eat in a lot on our travels but for some reason we have eaten out several times on this trip. Part of the reason for that is that we have not been taking a lunch with us. Think that may be changing now. A quiet evening and I guess we needed that. Jerry just asked me where we were and what day it was!